The photos above are of a sunfowr plant I had planted in a 40 cm (15") pot at the edge of my balcony in Cairo, Egypt. The birds seemed to like the taste of the sunflower plant leaves so I had to hange an old CD next to the sunflower plant in order to deter them and it did turn out to be very effective. I live in an apartment in Cairo, Egypt. A few days ago, I was hearing doves flapping their wings against my window as I woke up early in the morning. Yet I forgot to open up the curtain and check out what was going on. No big deal I though. 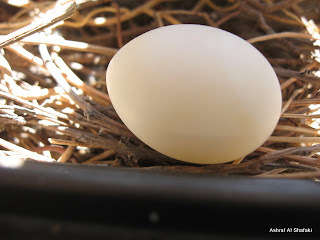 Two days ago, upon opening the window we discovered some sort of 'nest', a tiny white egg and a dove sitting next to it. 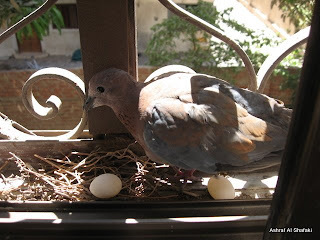 The dove was nesting right on my window sill! Every day I woke up with the intention of checking up on the dove but every time I forgot to actually do so. Today I finally remembered and managed to take some shots with camera. I can't wait to see when the eggs hatch. I hope they do! Sprouting many types of seeds can be an interesting thing to do and greatly increases their nutritional value. While fava beans (broad beans) are not among the commonly listed seeds for sprouting, yet in Egypt fava beans are the seeds which are commonly sprouted by ordinary Egyptians and used as a popular inexpensive Egyptian dish. Fava bean sprouts are called Fuul Nabet (فول نابت) in Arabic. Unlike with other sprouts, fava bean sprouts must be coocked first before eating. 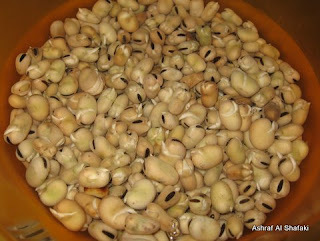 Fava beans are the most common type of food present in Egypt. It has been consumed by Ancient Egyptians thousands of years ago and is still the most popular type of food consumed in Egypt. There are numerous dishes that Egyptians make from fava beans. Fava bean srprouts is one of such popular Egyptian dishes. 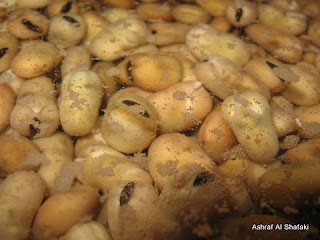 Soak the dry fava beans in water overnight. Rinse and move the fava beans into a colander next morning. Repeat the above process for a couple of days intill the fava beans start to sprout. It can take around 3 or 4 days for the seeds to sprout depending on the weather. During summer it takes fewer days than during winter. In Egypt it does not take long due to the warm weather yet in colder countries like in Europe for instance and North America fava beans would probably normally take longer to sprout on their own. Add fresh water to the rinsed fava bean sprouts. Add two small whole onions. Add three cloves of garlic. Add half a small spoon cumin. Heat the water till it boils. Keep boiling untill it is tender. Cooked fava bean sprouts can be served with lemon. The soup is delicious and can either be served alone or with the fava beans themselves. Some people eat the whole coocked fava bean sprouts while others peal them and only eat the more tender part inside the fava bean leaving the brown cover. Some people make sandwiches full of cooked fava bean sprouts and usually season them salt, cumin and chillies. They are considered a nutritionally rich yet inexpensive type of food in Egypt. Many lower class people in Egypt offer fava bean sprout sandwiches for free to others as a form of charity.